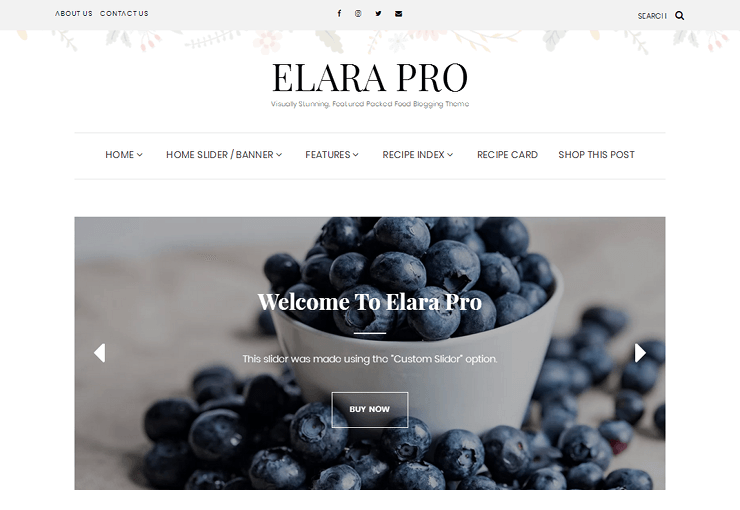 Elara Pro is a stunning food blog theme designed for elegance and simplicity. 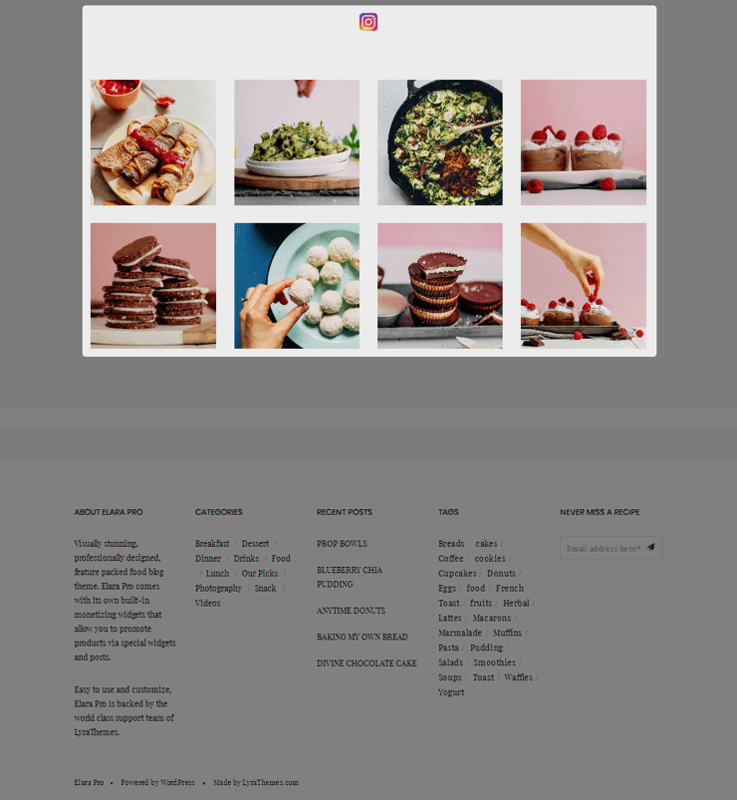 It does away with bloated features and focuses on a minimalist design optimized for food bloggers. We’re going to take a deeper look at this theme to see what it’s capable of in terms of style and functionality. Multiple Homepage Layouts – Choose from one of four homepage layouts to control the way your homepage handles sidebars and the included slider. Alternatively, you can use a static image with a call to action (banner) in place of the slider. Multiple Single Post Layouts – Insert ads for sponsors and affiliates with a sidebar, or omit the sidebar entirely for content-centric posts. 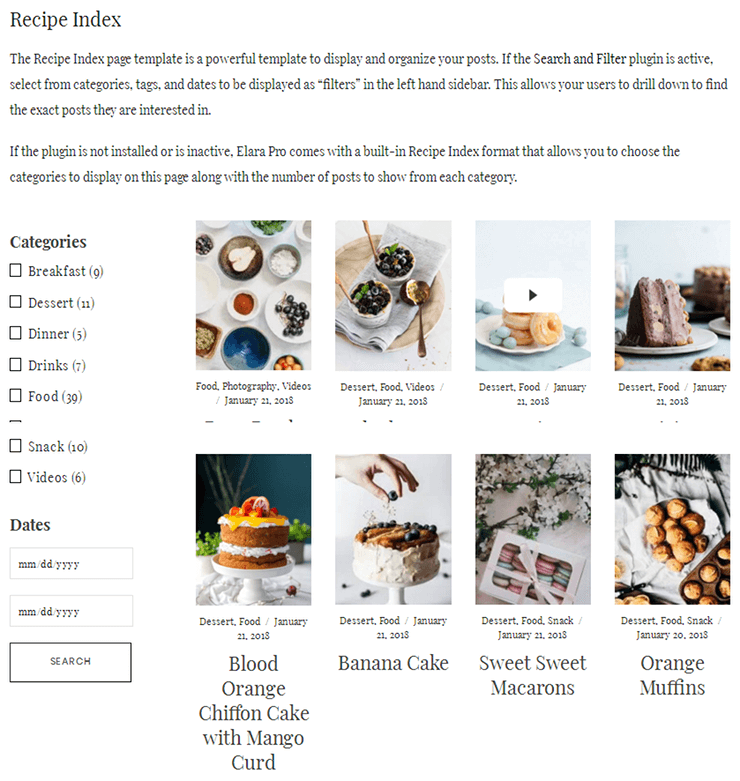 Built-In Recipe Card – Showcase your recipes in a sophisticated style and allow readers to print them easily with the built-in recipe card feature. Recipe Index with Filters – Allow readers to sift through your recipes with ease and filter them by cuisine (for example Italian, Mexican, Chinese, etc. ), ingredient (for example vegetarian, chicken, beef, etc.) or whatever you choose. 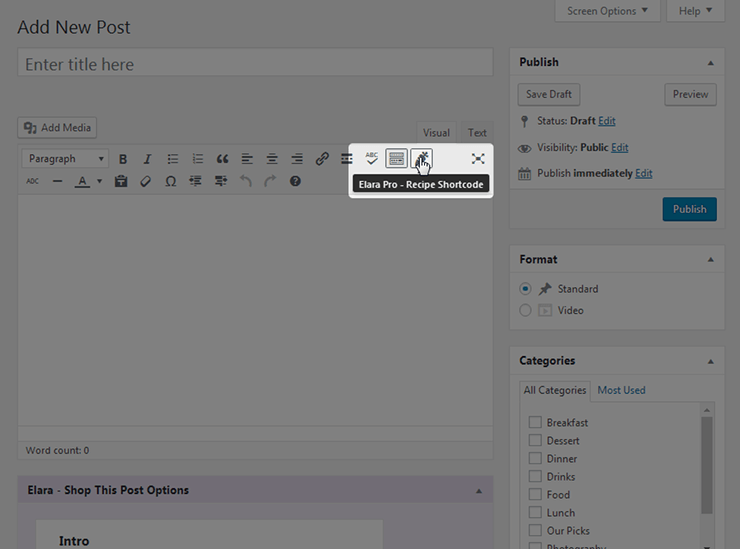 Front Page Featured and Highlighted Posts – Showcase your blog’s most popular categories and shine a light on your most popular posts with featured and highlighted posts. This is a great way to keep your users interested and engaged and to point them towards some of your best content. Built-In Widgets for Ads and Promos – Insert ads from your sponsors and affiliates or showcase your own products with the included widgets for advertisements and promotional boxes. 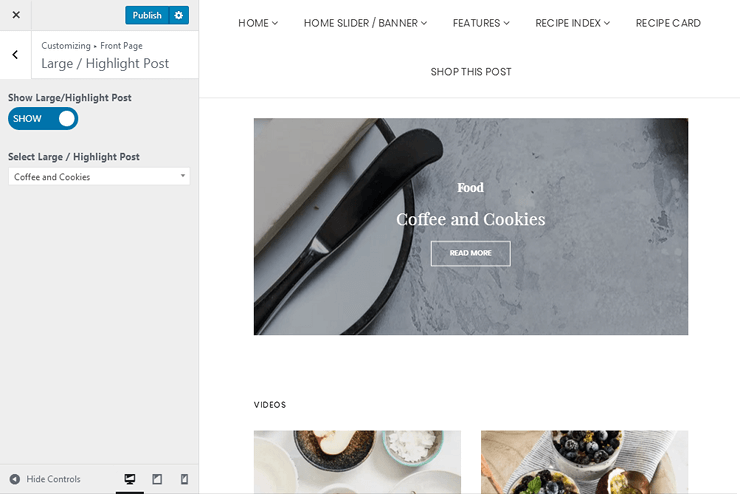 Shop This Post Feature – Increase your revenue from affiliates, such as Amazon, by showcasing the products you mention in your posts with images and purchase buttons. Let’s pick this theme apart by starting with the way it handles style and layouts. These are the four homepage layouts we mentioned earlier. They all use the same content and elements but showcase them in different ways. You can see each homepage uses the same header. 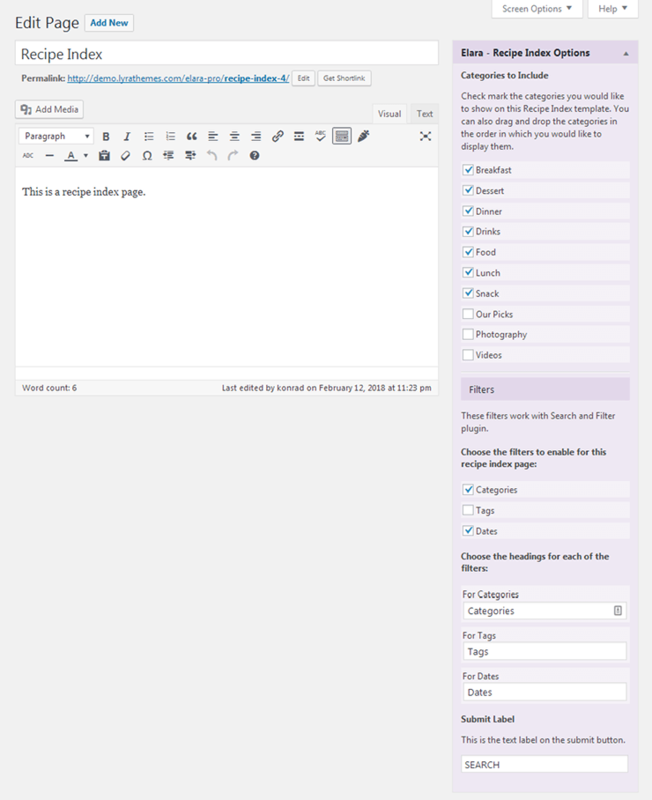 It uses a top bar for secondary navigation and social media links, a logo, and a main menu. If you look at the rest of the homepage, you can see the various ways you have to showcase your posts based on date, category and post format. 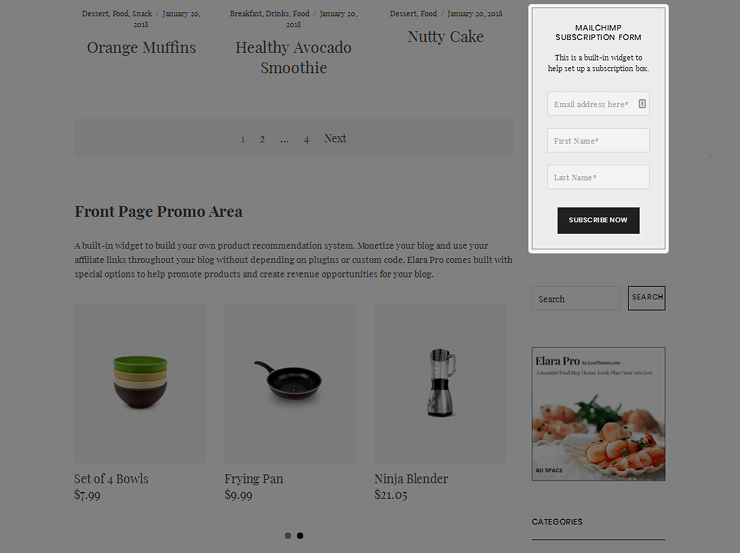 There is a place to showcase a promo box widget, where product and affiliate recommendations can be set up. You can also use the Featured Categories, Highlight Post, and Focus Category sections on the home page to feature some of your most important and timeless content. You’ll also see a grid of images from Instagram if you scroll far enough. 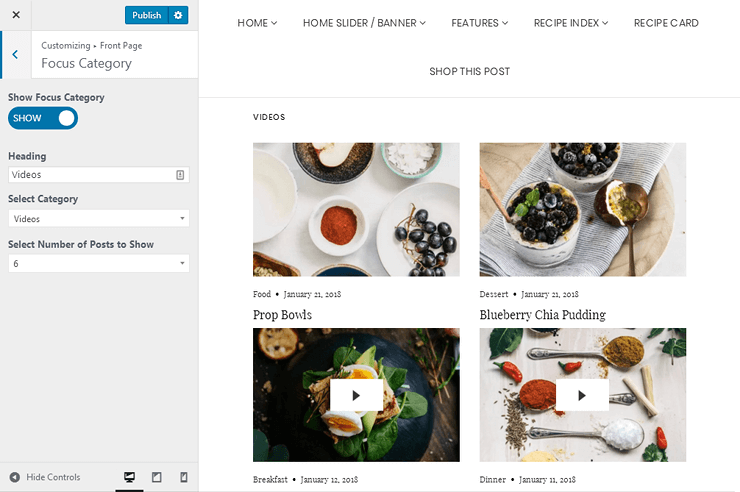 You have two post formats to choose from (Video and Standard) and three different layouts to choose from for the post page, giving you plenty of different ways to showcase your content. The Video Post format is optimized for YouTube videos. It’s a great option for vloggers and food bloggers who publish video tutorials for recipes. 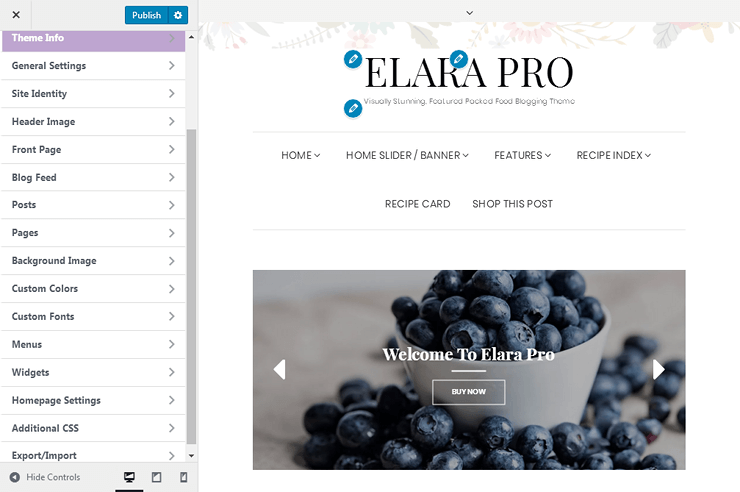 Elara Pro comes with a built-in MailChimp newsletter widget that you can use to easily set up a subscription form. With Elara Pro, you no longer need any extra plugins or code to show your affiliate links or link to the products you’d like to promote. This comes built into the theme: ad widgets and the specifically designed and developed Promo Box Widget and Shop This Post feature, all of which aid in increasing your sales and revenue through products and affiliate marketing. This recipe card layout lets readers know how many servings the recipe creates, how long it takes to make and how many calories it has per serving. Once you have a decent collection of recipes published, you can build recipe indexes complete with filters (or not). Let’s go over the backend of Elara Pro. 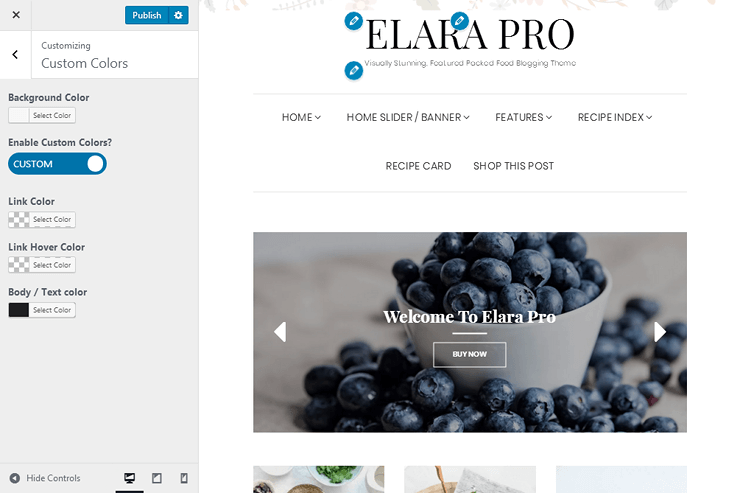 Using Elara Pro is simple. It starts with a simple installation process where all you need to do is upload the ZIP folder you receive from us to WordPress. Let’s start with the live theme customizer. You can accomplish a lot with Elara Pro’s customizer, starting with importing demo content. This makes it easy for you to finish your website’s design and start blogging. However, there are plenty of settings in the Elara Pro customizer that make it easy to do so manually. You can set up a text logo or upload your own, for starters. You can also customize nearly every part of the homepage. This is where you’ll choose between the banner and slider that exists at the top of the homepage. It’s also where you’ll control the content in them (images, calls to action, posts, etc.). You can also choose whether or not to show metadata on posts and pages, where to feature the sidebar if you don’t choose full-width layouts, whether or not to display featured images, and whether or not to feature related posts at the bottom of blog posts. …and customizing the fonts. You can choose from over 600 Google Fonts and customize your logo (text logos only), tagline, body text and headings. Elara Pro comes with a lot of widget areas that go beyond the use of one sidebar and footer. 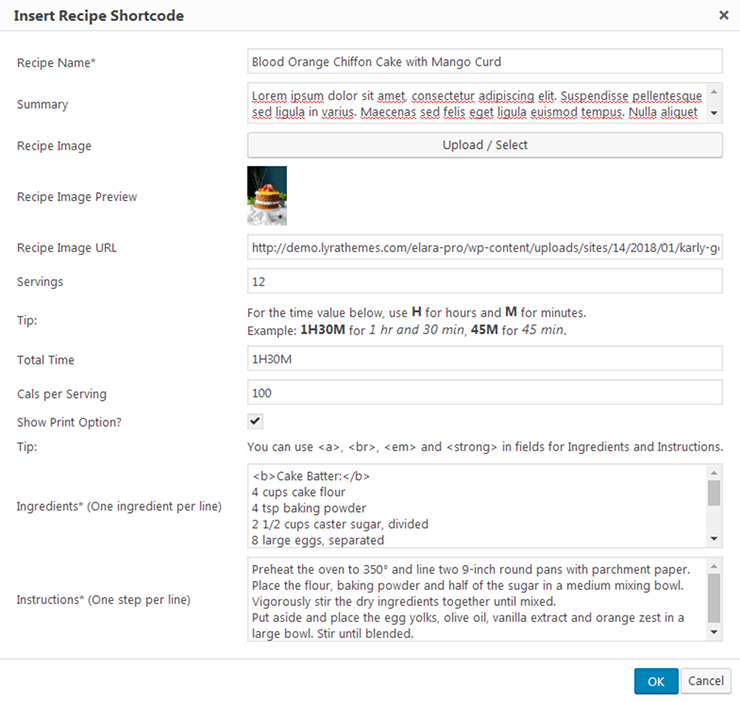 You’ll use the recipe shortcode builder through an icon in the WordPress post editor. It’ll bring up a lightbox you can use to insert your recipe. Creating a recipe index page is just as easy. All you need to do is a publish a new page using the Recipe Index template, then select which categories, tags and filters you want to add. Let’s wrap this up by talking about cost and support. Elara Pro is available for a one-time setup fee of $35. Ongoing support and theme updates are available for $7.99/month. Your first month is free, and you can cancel before your first month is up if you do not want to receive ongoing support. You can also cancel your subscription at any time. If you’re interested in Elara Pro, use the buttons to below to view the full demo or sales page for more information. How do i install the pro version of the theme. The update package could not be installed. No valid plugins were found. Will all the devices features work?